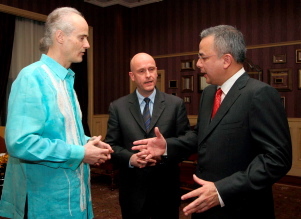 KUALA LUMPUR, April 29 (Bernama) -- Prince Alfred of Liechtenstein says peace is possible in this world and it all depends on the choices made by mankind. "Peace is possible. We can make this world a better place by giving it a chance. It is our choice. "If we cooperate and share our dreams and resources, this world will change and it is the fruit of our mutual support and empowerment. Peace will come," he said at a function to promote the second Asean event series, "Bridges-Dialogues Towards a Culture of Peace", here Tuesday evening. Present were the Raja Muda of Perak Raja Dr Nazrin Shah, Malaysian National News Agency (Bernama) chairman Datuk Seri Panglima Mohd Annuar Zaini, Chief Secretary to the Government Tan Sri Sidek Hassan, and the "Bridges" partner institutions and sponsors in Malaysia. Prince Alfred, who is the chairman of the advisory board of the International Peace Foundation in Vienna, said mankind had to act fast to make the world more peaceful. "Now is the time to build a better world and not in the future. Do not postpone it but start now. "If we want to do something good, do it now because life is a gift from our creator and every heart beat could be the last one. We have no control over it," he added. The "Bridges" event series, to be held in Malaysia and Thailand from Nov 2008 to April 2009, comprises up to 50 events with Nobel laureates. Each Nobel laureate who will visit the region separately will stay for four to six days where he or she will conduct lectures, seminars, workshops and dialogues in partnership with local Malaysian and Thai institutions.